You think you are pregnant. You are a child or teenager under age 19.
are leaving Temporary Assistance for Needy Families (TANF) and need health coverage. have a family with children under 19 with very low or no income. The Medicaid work requirement is unlikely to affect in significant numbers the portion of people who receive Medicaid and are eligible to work. Ninety-four percent of the Medicaid recipients are either already working or are exempt due to disability, school or care-giving responsibilities. Out of the 6% of the national population who are not working and covered by Medicaid, 2% are retired, 2% are unable to find work, while only 1% are not working for some other reason. Work requirement laws attached to Medicaid may cause some beneficiaries to lose coverage due to stringent reporting requirements. Most people losing Medicaid coverage would likely become uninsured due to limited affordable coverage for low-income individuals. This would be especially problematic for the many adults on Medicaid who will be unable to treat for severe and chronic medical problems and who require life-saving prescriptions. States are also likely to need to spend more money with this law due to having to hire additional staff to implement the new requirement–making it highly questionable whether this law is an effective use of tax dollars. This policy is likely to disproportionately hurt older adults, people with disabilities, and caregivers who are likely to face challenges meeting exemptions or navigating exemption policies. 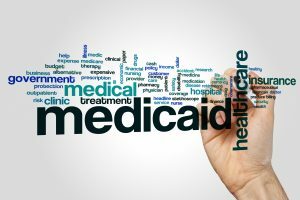 As of January 2018, nine other states—not including Georgia–have submitted Medicaid waiver proposals to the Center for Medicare and Medicaid Services (CMS), showing how important of an issue these work requirements have become. These are issues to discuss with your elected state representatives and to analyze with candidates in the upcoming elections. If you have any questions about Medicaid coverage, please contact this law firm.